Noise Figure is simply the ratio of So/No to Si/Ni usually expressed in dB. It has the advantage of being independent of receiver bandwidth (Duffy 2013). The Noise Figure was calculated from measurements using a RFD-2305 calibrated noise source using the Y Factor method. 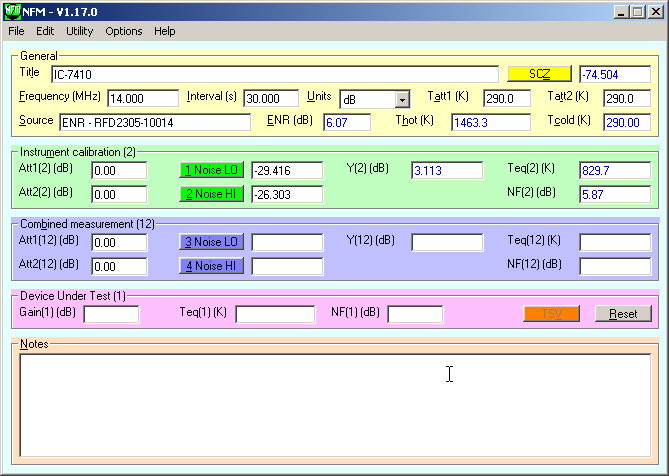 NFM software (Duffy 2007) was used to perform high resolution measurements of noise with the source OFF and ON. The calculated Noise Figure is 5.9dB. The Effective Noise Bandwidth of the nominal 2400Hz soft filter was measured to be 2040Hz (Duffy 2009). The IC-7410 specifications state a sensitivity of 0.16µV for 10dB S/N with that filter, from which an expected Noise Figure can be calculated (Duffy 2006) to be 8.0dB. The receiver exceeds specification by just over 2dB. Duffy, O. 2004. Noise Figure Y factor method calculator. VK1OD.net (offline). ———. 2007. Noise Figure Meter. https://owenduffy.net/software/nfm/index.htm. ———. 2009. Measuring receiver bandwidth. VK1OD.net (offline). ———. 2013. Noise and Receivers. VK1OD.net (offline).